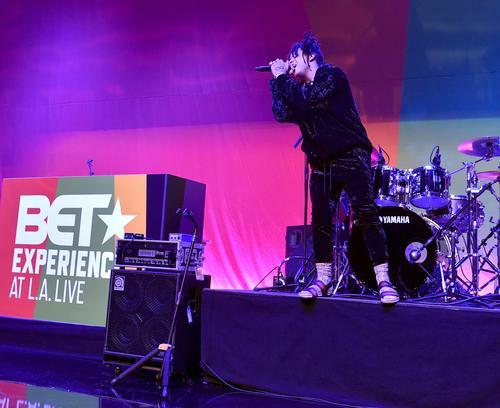 Trippie Redd's mother likely knows him more by his given name, Michael Lamar White IV, but she just paid homage to his music career in a big way. With his debut album releasing next week, Momma Redd decided to show off just how proud she is of her son by getting his name permanently inked into her skin. We'll soon be able to hear Life's A Trip in its entirety and we can safely assume that Trippie played the record for his mom before the official release date. She must have liked it so much that she got his name tattooed onto her arm. This isn't a little tat either as Momma Redd just about filled up her entire forearm with red ink. Everybody that sees her on the street will know that she birthed a rap superstar as the Canton product looks poised to show off his full range of versatility next week. Big 14 showed off his mom's new work on his Instagram page, adding that their love is forever. He wrote, "Momma redd said “Foe Life n---a”😂❤️🔥🔥🔥🔥☺️💜"
We've already heard "Together/Bigger Than Satan," which has received mixed reviews but people are excited to hear what Trippie can do on his own and are bound to tune in come next Friday. Shoutout to Momma Redd for showing that kind of love to her son. Wendy Williiams Claims Kim Kardashian Is "Unsatisfied With Her Marriage"